With an extensive inventory of over 6,000 diamond, CDX and CBN Borazon wheels, Eagle Superabrasives is a leading source of superabrasive supplies in the United States. Ninety-percent of orders are on location at our Hickory, NC, headquarters and are ready for same-day shipping. We can even fill custom orders in as little as seven days. 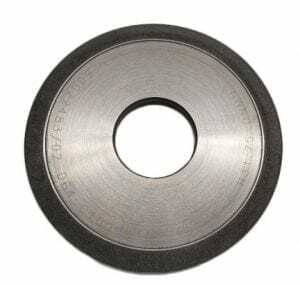 Don’t settle for subpar superabrasives; contact the experts at Eagle Superabrasives for all your grinding needs. Although diamond grinding wheels have a history of superior performance, they’re sharing the spotlight with Borazon wheels. The Borazon crystal rivals the diamond in strength and durability. Named for its cubic form of boron nitride (cBN), Borazon crystals are forged from equal parts of boron and nitrogen. The compounds withstand intense heating to 1800 degrees Celsius. And depending on their chemical makeup, can be either black, brown or gold. Its composition makes the Borazon crystal one of the hardest materials on earth. Diamond wheels have historically been the superabrasive of choice because of their superior ability for grinding and shaping. But because of their carbon compound, diamonds had trouble grinding steel. At high temperatures, carbon will dissolve iron. Aluminum oxide was the conventional abrasive for grinding steel. But with its impressive abrasive qualities, Borazon wheels quickly became the preferred alternative. Today, industrial applications overwhelming utilize Borazon wheels. The wheels grind hard metals, cast irons and nickel-base super alloys faster and with more precision than other abrasives. Borazon wheels are also becoming popular in jewelry making because they can withstand heat greater than 2000 degrees Celsius. Diamonds are only able to reach around 800 degrees Celsius before breaking down. In addition, Borazon wheels grind with a higher degree of accuracy than other abrasives, making it ideal for intricate jewelry making. Most often, the life of a Borazon wheel is not dependent on its cutting surface. The breakdown of the bonding agent used to adhere the wheel to the metal core is usually the reason for performance issues. But the superior bonding systems and formulas used at Eagle Superabrasives ensures that our grinding wheels stay strong and last longer. With a selection of polyimide, phenolic, metal and hybrid bonds, and six different core materials, we are confident in the integrity of our products. When you’re ready to try the best, trust the experts at Eagles Superabrasives. Our experienced staff will provide support and advice along the way. With unparalleled customer service, superior products and fast shipping, Eagle Superabrasives is an easy choice for all your grinding needs. Contact us today to place an order!